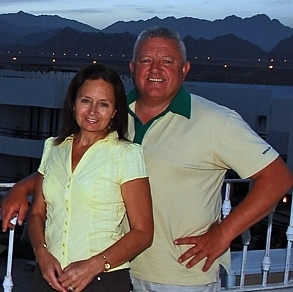 Divers United is owned and managed by British Husband and wife team Alun and Moyra Evans, who are divers themselves, and have been diving since 1984. They settled on the Shores of the Red Sea in 2002, to pursue their dream of making a career of the activity they both love so much. In 2005 they formed Elite Diving which in turn took ownership of Divers United in early 2008. They have transformed its image, and turned Divers United into a 5 star PADI Resort. Nothing is too much trouble for the team at Divers United. They simply offer a personal service where all guests receive the VIP treatment. Our mission is to facilitate and help divers and their families to get the most from their diving holiday by offering our personal attention and services whilst diving or diver training.